Each table is different and can be used for a minimum to maximum set of players. You can add extra players to a max of 10 by adding extra Hand Zones. You can read about Hand Zones here. Both Custom Square and Custom Rectangle tables can have images added to them for extra flare. You can add images as the actual game board, or for backgrounds for your play areas. 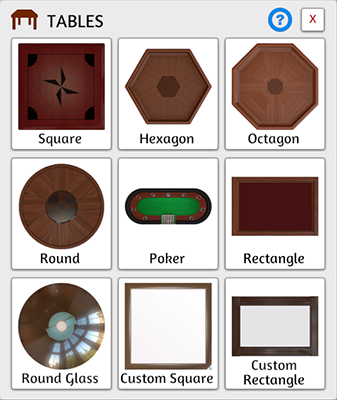 You can create your own custom tables and placing them over the built in tables if you wanted something completely different. You can view examples in our DLCs or on the Workshop.